Instagram Stories started out as basically a clone of Snapchat Stories. Yet, despite the fact that it was late, Instagram’s Stories now have more daily users than its competition. According to a TechCrunch report, as a result of the new feature, Snapchat posting volume declined and Story views fell by fifteen to forty percent. Six months following its release Instagram Stories hit 150 million daily users, just under Snapchat’s entire daily user base. Both apps are useful for creating a social media presence for your brand as they are both unique. To determine which would be more beneficial for your brand, you’d first need to understand who your target audience is. There are many tools for Instagram, along with its relatively new “Instagram for business” feature that provides analytics on your already existing audience. In general fifty-nine percent of all 18 to 29-year olds in the U.S. use Instagram according to the Pew Research study. Around thirty-three percent of 30 to 49 year-olds use the app. Studies also show that Instagram followers tend to accept and engage with product-based content better when compared to that of Snapchat users. Snapchat may be better if you’re targeting a younger audience as sixty percent of the app’s users are under the age of 25. Besides demographics, most influencers prefer Instagram Stories. Mainly because it’s a feature on an app they’ve already established a following on. If your social media marketing plans include influencers, that’s worth contemplating. If you already have a facebook ads account it’s also much easier to drive traffic and retarget visitors to your site using Instagram ads. Many say Facebook is copying Snapchat, and they are. They previously attempted to purchase Snapchat for Three billion dollars but the offer was turned down. Since then Facebook has set out to take their user base by adding all of the app’s key features to its own social media platforms, which include Instagram. No matter which platform you chose to focus on, storytelling would still be key to successful social media marketing. Advertisers are using Stories as a tool to connect with their audience. Instagram Stories give content creators the opportunity to do this in unique ways. Story usage from brands and the engagement with them are high. Seventy percent of users follow at least one brand on Instagram. Thirty-three percent of the most viewed Stories are from businesses. You can give a behind the scenes look, with a tour of your office. Or post clips of events and preview new products/ services. You can likewise do “a day in the office” or a day in the life of your workers. 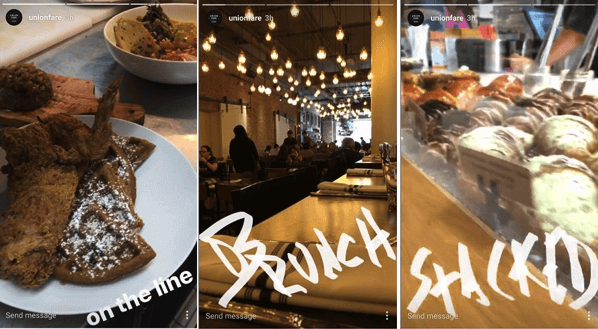 Union Fare, a New York restaurant, uses Instagram Stories to share what they’re up too. This gives viewers a perspective on their awesome food. Viewers seeing these stories just might head right to their store. To urge costumers to use your products, post Stories of creative ways to use it! Even better, it may depend on your product but you can do; DIY hacks, and creative tutorials (for products relating to food, fashion or arts, and crafts). If you have a new product, team member, or you’re rolling out major improvements you can announce it through Instagram stories. This will keep your followers in the loop and make them more inclined to purchase from you. You can showcase the item by showing the different uses. You can also highlight the features of your products and the benefits using them. 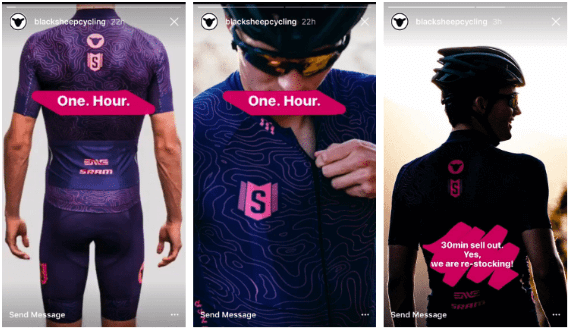 For example; Black Sheep Cycling use their Stories to creatively promote new clothing to their audience in various ways. One way you can increase your engagement is by hosting giveaways or giving out special incentives to your followers. Instagram Stories are the ideal place to give out coupons and prizes. Since they only last 24 hours, this gives a sense of urgency to use your coupons. Repost your customer’s content. This allows you to both advertise your product and make your customer feel appreciated. 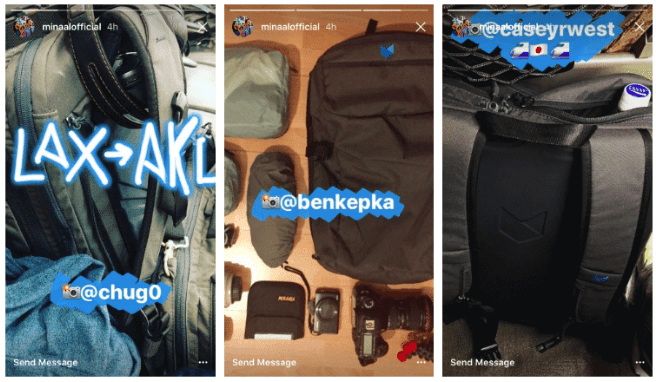 Take Minaal for example, a travel gear brand. They share posts from followers traveling the globe using their travel bags and gear. Lastly, the content on your Instagram Stories should seem as if they’re happening now, even if it isn’t. Your Story should be unique and engaging. However, It doesn’t have to be picture perfect like your regular feed posts. It’s a great opportunity for creativity and experimentation.